Last week the New York State Assembly passed a law that would allow for the sale and distribution of marijuana products to terminally ill and chronically sick New Yorkers. This is the seventh time since 2007 that the state assembly passed the measure, however each time it has been rejected by the state senate. The reasons why the measure has not passed before have more to do with party politics than anything else. What makes last week’s vote different though is that it looks like this time the bill could actually pass in the state senate and be on Governor Andrew Cuomo’s desk for a signature before the end of the summer. So if medical marijuana does become a reality in the Empire State, what does that mean for patients and the companies who insure them? New York State, through progressive minded in many ways, is still not among the more than 20 states who have medical marijuana laws on their books. New York is even further behind the couple of states who have made the outright sale and distribution of marijuana to anyone over the age of 21 legal. The main problem with medical marijuana and health insurance companies is that marijuana is not federally classified as medicine. Meaning that it has not undergone the required large scale testing administered by the Federal Drug Administration (FDA). This testing process is something that every medication is required to go through before it can be sold or prescribed in the United States. That also goes for being covered by health insurance. If it’s not FDA approved, then doctors cannot prescribe it, simple as that. Getting that FDA approval is a costly and time consuming process for any drug. But the current classification of marijuana as a Schedule I substance under the federal Controlled Substances Act means that the large scale studies needed for approval are much more logistically complicated. Marijuana’s Schedule I classification means that the substance is considered to have a high potential for abuse and no accepted medical use. Because of that, extra precautions are mandated in order to study it. These precautions include getting approval from the FDA for the study as well as also getting approval from several different agencies within the FDA. Not to mention those conducting the study also need to get a permit from the Drug Enforcement Administration. How is it done in other states? Because of this non-approval from the FDA for marijuana, doctors are barred from outright prescribing the substance to their patients. Typically they can only offer their medical opinion and recommend that a patient seek treatment with medical marijuana. But once a patient has been recommended medical marijuana, how do they afford it? One reason a medication is prescribed is so that it can be covered by the patient’s health insurance. However since medical marijuana cannot be prescribed, patients seeking treatment who cannot afford it out of pocket are left with few options. One is that they can grow and cultivate their own plants. Many states’ medical marijuana laws allow patients to grow a certain number of plants for their personal use. But that method comes with its own costs, and can be difficult if a patient has impaired mobility. 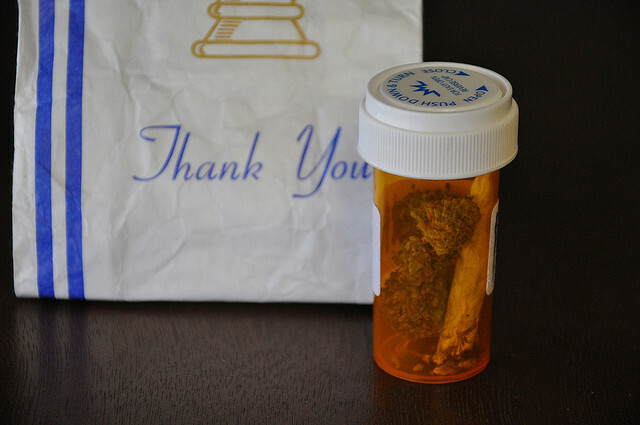 Despite being allowed to grow their own, most patients choose to seek out treatment at a dispensary. Depending on the severity of their illness a weekly supply of marijuana could cost up to $1,000 a month. For patients suffering from debilitating chronic or terminal diseases that is typically much more than they could afford, especially if they are not working. As a stopgap solution there are groups known as compassionate care organizations that help subsidize the cost of medical marijuana for elderly and terminally ill patients who could not otherwise afford it. In states like California, small barter economies have also sprung up for patients who need to get their medicine at a reduced price. Many trade chores and time helping out at dispensaries or co-ops where the cannabis is grown in exchange for cheaper medical marijuana. So how will it all shake out in New York State? As we mentioned above the current legislative session ends on June 19, and both sides for the moment appear to be at an impasse. No doubt the outcome of the next few weeks of debate on the issue will have an impact on local NYS elections in the fall. But New York State instituting medical marijuana would have far reaching consequences for the state, both good and bad.